Are you looking for healthy recipes to make at home? Check out veganmexicanfood.com! Heat 2 quarts of water in a large pot on medium-high heat. Add the cabbage, crushed tomatoes, onions, garlic, salt, oil, lemon juice, and tomato sauce. Cover the pot and allow to cook for approximately 20- 30 minutes while you make the albondigas. If the cabbage is tender and you have not completed making the albondigas, turn off the heat and set the soup aside. Add the oats. At a low boil, allow the oats to cook for 7 minutes while continually stirring until thick. If the oats become too thick, an additional ¼ cup of water can be added. Remove from heat and cover for 5 minutes. In a non-stick pan on medium heat, add ¼ cup of water. Once hot, add all the vegetables and nuts in the pan to water sauté. Do not stir. Once the edges of the vegetables begin to caramelize, stir while adding 2-4 tablespoons of water. This keeps the ingredients from sticking and burning. As the water evaporates, continue to add 2-4 tablespoons of water and stir. Repeat this process until vegetables are soft. Add tomato sauce to the vegetable and nut mixture. Add 2 to 2 ½ cups of the cooked oats to the pan and mix well to incorporate the vegetable and nut mixture into the oats. Add the oat mixture to a food processor with the “s” blade and pulse in small bursts about 10 to 12 times or about 30 seconds. The mixture should stick together. Transfer the oat mixture to a large bowl. Add 1 cup of cooked brown rice. Mix until everything is well incorporated. Press the mixture down until compacted. Using a medium melon baller (1 ½ inch diameter), scoop out balls and place them on a baking sheet lined with parchment paper. Taking one ball in your hand, roll it so that the outside of the ball is lightly coated with the oil. (Note: Balls should not be saturated with oil – only a little oil is needed.) Place the ball on the lined baking sheet. Continue this process until all balls are coated. Let the balls rest while preheating the oven to 375 degrees. Place the balls in the oven and cook for approximately 10 minutes. Turn them over and cook them another 10 minutes. They should just begin to brown. They can be cooked up to about 30 minutes. Make sure to turn them over so they do not brown too much on one side. Remove the albondigas from the oven once done. 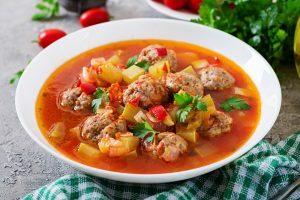 Place 3 to 4 albondigas in a soup bowl. Ladle hot soup to cover the albondigas. Garnish with your favorites. Some of ours are vegan sour cream, grated carrots or onions, and of course, salsa. Note: As the albondigas are very tender and may fall apart, do not boil them in the soup. They can be gently simmered in the soup, however, if warmed again as leftovers they will fall apart. As such, we suggest that you prepare them separately and take care when serving.